It’s like a school. Direct yourself to love of Sayedina Muhammad (s), and he (as) will begin to perfect that love. He is going to teach us the character that Allah loves, teach us how to wash, how to pray, how to fast, how to read our holy book, how to perfect ourselves in his perfection. 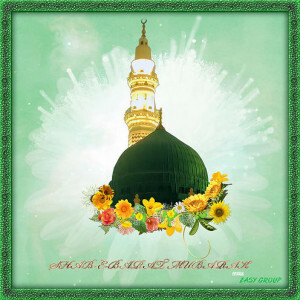 So obedience to Allah (swt) opens the door to obedience to Prophet (s) – if the love is sincere. That’s why the highest realities Allah (swt) are beginning to open. There are people who don‘t come to love of Sayedina Muhammad (s) and they’re happy with a love of Allah (swt) that satisfies themselves and they make for themselves an Allah that is from their own desires. But when that love of Sayedina Muhammad (s) is moving through the heart, it’s a grant from Divine Presence, and we are all her from that Divine grant – not our cleverness. Many people are even born into Islam and they don’t have that love of Sayedina Muhammad (s). It’s a grant from Divine. When You love me and accept me and I am granting you that, now go to the one who is going to perfect your love. They said, “No, what’s coming is worse than the plague of Sayedina Musa (as)!” That destruction is coming on the wings of angels. Destruction does not come from shaytan. This is other people’s belief because in their books they write about disaster and destruction as if it was from the devil, because the devil wants people to think he has power, saying “fear me! I bring destruction!” and he always shows their God in a pyjama and beaten – may the Divine forgive us all! And hanging on something and then whispering in their ears, “is that your God? Look how I beat him! I am the one who brings destruction! It means Sayedina Mahdi is coming with a different level of belief. All idol worshipping is going to go. You are running towards buildings? No. You must be around those whose hearts are like Kabba, so they can make your heart like Kabba, muwahid! That in their heart is only love of Allah (swt). “O our Lord! We are trying our best to obey,” and Allah saying “direct yourself to Sayedina Muhammad (s). You put your life, your death, your wealth, your family, everything at his feet. And if he says you sit and die then you sit and die, and if he signed off that nothing is going to touch you, then nothing is going to touch you! Means that it’s not my place to judge anyone. Who Sayedina Muhammad (s) loved, we love. Whom are the blood and light of Sayedina Muhammad (s), we love. Then the Medina Munawwarah, the “City of Lights”, begins to open within the heart. Kabba becomes the container. The heart says this heart is now ready to contain my light once Allah (swt) gives permission. Means that the first door we are going through is towards Allah (swt). He begins to fix the heart; that this heart is sincere, and I’m going to make it like a Kabba, now accompany those who are like a Kabba! And when love of of Sayedina Muhammad (s) begins to enter and the entire being is lost in the love of Prophet (s), they can’t live without hearing salawats, they find no happiness without constantly remembering Prophet (s), and then every celebration is not a celebration without remembering and celebrating the life of of Sayedina Muhammad (s). 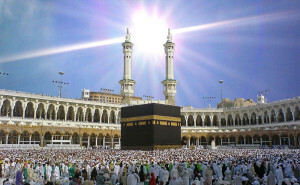 Then the city of light is opening in the Kabba, because what light is going to open in your heart? Allah’s light? There’s no way! If that light comes you’d be dead! If you want to be from Madina, find these saints! Then we found them! Now the journey begins at their door back to that reality. So now we’re at the door to the ulu ‘amr saying, “Protect us from these antichrist, protect us from these confusions and difficulties that are coming, confusion has overtaken me!” And they teach us “learn how to enter our heart.” You will find no safety unless it’s in their heart, because we’ve said their heart is Mecca! 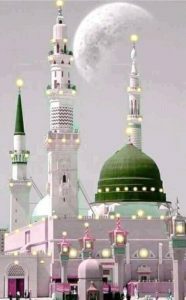 Their heart is Medina, and they are the reality of Sham as-Shareef. All saints are based out of Sham, when you see them this is just an imitation of their being, but their reality is based out of Damascus. So at their door their saying, “if you want to be safe, then enter into our heart.” So then we begin to concentrate, meditate on moving into their heart. There is nothing that will be protected except the heart of these saints. So then we begin to occupy ourselves with their love; that when we’re praying, fasting, eating and drinking we are constantly thinking of them, asking that they dress us and bless us and fill us with that light. Mawlana Shaykh teaching for us it’s like you have the best laptop available, worth thousands of dollars, but if you don’t have a wi-fi connection, that laptop is completely useless. It may be the best and the latest package, but unless it has an ability to log on and receive a connection, there is no connection – it’s just a piece of equipment. So we are at their door, we have all our equipment, we have that love, now we are entering into that reality and their wi-fi begins to send that which we don’t have. And as we’re moving in that energy, they begin to take us to their connection to the heart of Sayedina Muhammad (s), and only through their door can you enter into the heart of Sayedina Muhammad (s), and only thru the heart of Prophet (s) can you witness the magnificence and munificence of Allah’s light. It’s all through the heart of Prophet (s). So we pray in these days of panicking, where am I going to run and where am I going to hide? There is no where that is going to be safe. It’s finished. Only safety is in their heart. With love for them that we move into their heart and they begin to dress our light from their reality, and as their reality begins to dress us, bless us and move us into the presence of Prophet (s), then the real ahlul bayt, they are the real ahlul bayt of light and of blood, that they received their certificate in the presence of Sayedina Muhammad (s). It means that they’re able to bring that light and bring people to the presence of Sayedina Muhammad (s), and at that time that audience is from soul to soul, and Prophet (s) begins to send his light, and that light begins to dress those students. That light is the only light that perfects us, and that light is the only light that protects us. So then saints are dressing us, testing us, and perfecting us, as we enter into their heart and move into the presence of Sayedina Muhammad (s), if that light dressing us, then Allah’s (swt) light is already blessing us. And if that blessing comes, there is nothing that can touch that person – in accordance with what Allah (swt) wants. Whatever Allah (swt) wants is going to happen. And if Allah (swt) doesn’t want it, nothing is going to happen. If everything is blown up, and that servant under permission from Allah (swt) is just making prostration, nothing will happen. Everything will burn except that servant. It’s in Allah’s (swt) hands. These are the days of faith, as we said before about chapter 2 that Sultan ul Awliya was opening, from action now is coming the world of faith. We can talk all we want, but now becomes the days that saying doesn’t mean anything, but the action and the ocean of faith is going to be visible. We pray that we move into that ocean, that we are protected by that ocean, that we move into that light and into that love, and into that reality that saints bless us and protect us and bring us into the heart of Sayedina Muhammad (s), that Prophet (s) be happy and satisfied, and present us to Allah’s Divinely Presence. Bi-hurmatil Mustafa, wa bi-sirr as-Suratul Fatiha.